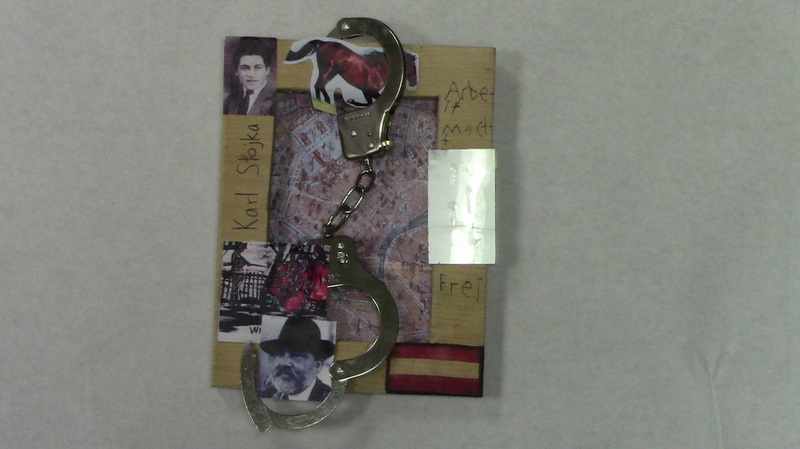 This shadow box represents Karl Stojka and his life before, during and after the Holocaust. The first thing you will notice in this shadow box is the handcuffs. These are supposed to represent being arrested and thrown in a concentration camp and losing his freedom. On the top the handcuffs are locked onto a horse. This is because before the Holocaust Karl’s family worked in a caravan as horse traders. Next to the horse is a picture of Karl before the war. At the bottom the handcuff is unlocked which represents Karl’s life after the war. The painting is one of his very own and the the portrait is of him as well. On the right side there is a picture of a death march as well as the words, “Arbeit macht frei” which means “work makes you free” in German. The reason for the death march picture is that Karl survived a death march and was freed by American troops. The Austrian flag represents the fact that Karl was born in Austria and lived there after the war. The background picture is of Vienna, the capital of Austria, where Karl lived before the war. "We were allowed to visit him there. He was standing in the visitors' room behind a very small grid so that you could hardly see him. He was pleased to see us, but all I could feel of his kiss on my lips was the cold iron of the grid. After just a few words, they took him away.” This was the last time Karl Stojka ever saw his father; it was late 1941. A few weeks later Karl’s family received his father’s death report as well as a box of ash, bone and his father’s plaid suit. He was murdered in the Mauthausen concentration camp. Years before the Holocaust, Karl Stojka was born on April 20, 1931. His parents were Roman Catholic Gypsies, also called Roma. Karl was the fourth of six children, and he was born in Wampersdorf, a village in eastern Austria. The Stojka family belonged to a tribe of gypsies called the Lowara Roma. They traveled across the country as horse traders in their caravan. Karl was used to living in a wagon and the freedom that came with that. In the winter, his family stayed in Vienna, Austria's capital. In 1939, Karl’s family was forced to permanently reside in Vienna; after Germany occupied Austria, it was forbidden for the gypsies to move. His father and eldest sister supported the family by working in a factory, and the Stojkas also converted their wagon into a wooden home. At this time Karl started attending grade school with his other young siblings. Karl’s family faced the Holocaust without a father. It all started in 1938 when Germany invaded and occupied Austria, where Karl and his family lived. The Germans turned Jews, Sinti, and Roma into outcasts. These ethnic groups were forbidden to change their place of residence. In 1943 Karl was arrested along with the rest of his family. It happened when Karl was at school; a group of SS soldiers entered the classroom and forced the students to “Heil Hitler.” The teacher then talked to the SS men and called Karl over. The soldiers took him to his home, where the rest of his family as well as more Gestapo and SS waited. They ordered Karl and his family to leave their home in Vienna and get on a truck. They were taken to the police jail, Roßauerlände. Here they stayed in cells with hundreds of other Roma for two or three days. Then they were put on a train going to Auschwitz-Birkenau. Once Karl and his family arrived in Auschwitz-Birkenau, they were stripped of all their belongings, and the Nazis even took their hair and clothes, anything of value. They were even tattooed on their left forearm. To the Nazis Karl was just Z-5742, not an actual person. After this they were brought to the gypsy camp inside of Birkenau. Luckily for Karl, he was placed in the same block as his relatives, Block No. 10. Living conditions in Auschwitz-Birkenau were terrible, and there was little food, most of it consisted of turnips and clear soup. The prisoners were also forbidden to socialize, especially while they were working. One day Ossi, Karl’s six year old brother came down with typhus and went to the medical barracks. There was no doctor there, and Ossi died of starvation. In August of 1944, Karl was transported to Buchenwald, one of the largest concentration camps built on German soil. Of the 2,000 Gypsies that were alive in Birkenau, only 918 of them were transferred to Buchenwald to do forced labor. The other gypsies who were not selected were to be gassed immediately in Birkenau. When Karl and the other gypsies arrived in Buchenwald, the German officials decided that 200 of the 918 gypsies were unable to work and should be sent back to Birkenau to be gassed, and Karl was one of them. The Germans thought he was too young to work. However Karl’s uncle and brother begged and pleaded that he stay; they said that Karl was fourteen but a dwarf. He was allowed to stay. The conditions in Buchenwald were also terrible. All inmates of this camp had triangles attached to their shirts, and the color of these triangles identified the prisoners. Since Karl was a gypsy, he most likely wore a black triangle. After Karl had been in Buchenwald for less than a year, he was transferred yet again to another camp. This camp was also in Germany, near the Czechoslovakian border. Its name was Flossenbürg. Karl had just arrived in his new camp when the the Nazis ordered a forced evacuation or “death march.” The intended destination was Dachau. The reason for this evacuation was that US forces were closing in on the camp. It was mid-April 1945. There were about 9,300 prisoners involved in this death march, and 7,000 of them came from Buchenwald. In a death march, prisoners were forced to march for miles. The prisoners were already weak or ill, and the marches were just another way to kill them. Approximately 7,000 prisoners died during this death march, whether it was due to exhaustion, starvation or execution by the Nazi soldiers. Karl survived the march and was freed by American soldiers near Roetz, Germany. This was on April 24, 1945. After the Holocaust, Karl spent some time in the US and in European countries. Then he returned to his hometown of Vienna where he lived until his passing in 2003. Karl also started painting after the war as a way to cope with the persecution that the Roma suffered. “When I paint a picture, I don't just paint the house, the flowers, the fields or the tree. No, I paint what is inside my body, what my heart says, my blood and soul. Because only if you believe in a soul, only if you believe there really is another life after this one, can you paint these paintings.” This is what Karl Stojka said when asked about his paintings. As you can tell, the Holocaust had a huge effect on Karl. He uses his painting as a way to show the rest of the world who were not involved in the Holocaust the horror that he and millions of other people faced.